I consider myself very fortunate. 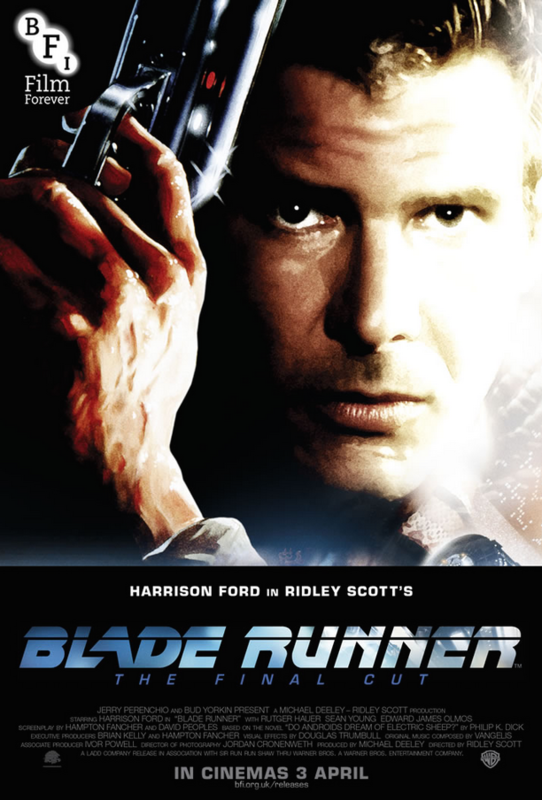 Recently, the God of Biomechanics, deemed me lucky enough to see BladeRunner: The Final Cut in all its digitally restored, cinematic glory, at my local independent cinema! Excited, and awash with anticipation for what I was about to behold, I sat thinking about BladeRunners troubled history. Neither a box office nor critical hit, it was blasted by most critics, who thought the awesome visuals overwhelmed its narrative and themes, when in fact, they helped advance the story and themes. There’s a beautiful darkness about BladeRunnner, a feeling of melancholy and nostalgia, a reflection of a possible future, which many find depressing. A lot of that stems from Ridley Scott’s upbringing. The Hades landscape and rain drenched streets are inspired by his South Shields, industrial home town. As with ALIEN, Scott brought on board many talented matte artists, designers, model makers and special effects personnel to help create his vision, including Syd Mead, Douglas Trumbull, Richard Yurichich, David Dryer, and one of the greatest cinematographers of all time, Jordan Cronenweth. There are beautiful references to two greats of cinema history, Citizen Kane and Metropolis. The lighting of Tyrell's office looks very similar to the Thatcher Library scene from Citizen Kane. The entire sequence is a visual tour-de-force, still unsurpassed and yet to be matched. Then there’s the tec and toys, Deckard's gun, the Esper Unit, the Voight Kampff machine, flat screens, vid-phones, the Police Spinners, The White Dragon noodle bar, the neon signage which dominates the streets, Sebastian's homemade toys, Gaff's origami animals, even the chess sets, spirit bottles and glasses are beautiful. BladeRunner may be the best example of the detail and beauty Ridley Scott lavishes on his projects. The Los Angeles 2019 streets are filled with a multi-ethnic, Moebius-inspired populace, blending eastern and western cultures. It combines the old with the new, the real with the fake; perception is a theme which permeates the story. Into this world come the escaped Replicants. The paradox being that the Replicants actually value ‘life’, more than the humans the blade runners are protecting. Night, rain and smoke were utilised to enhance this neo-noir, dystopian metropolis, and are a Ridley Scott staple, and came about mainly because he never had enough effects budget to work with. Seeing it on the big screen, the digital restoration reveals its staggering beauty, and the beautiful and emotive score by Vangelis, which is definitely one of the greatest ever soundtracks, merges seamlessly with the breathtaking visuals. It just doesn't get better than this! Like The Directors Cut, The Final Cut is also devoid of Harrison Ford's rather annoying, drone of a voice-over, and of course the tacked on ‘happy ending’, where Deckard and Rachael ride off into the sunset, marring the theatrical release for many viewers. The Final Cut gave Ridley the chance to rectify some scenes, digitally. Most notably Zhora's death. It also contains the original full length version of the unicorn dream, never seen in any of the other cuts of the film. All of the alternate edits and additional violence from the International Cut have also been inserted. There’s no doubt that BladeRunner was groundbreaking. A playbook for film makers, there’s hardly a Sci-fi movie that it hasn’t influenced. It has inspired everything, from the Cyberpunk generation, to art, anime and music. You would have a hard time finding a film that looks and sounds more gorgeous. The first time I saw BladeRunner I thought it was both remarkable and breathtaking. All these years later it has lost none of its power. For me it has always been a truly immersive experience. Extraordinary, thoughtful, atmospheric, intense, intelligent, complex, multi-layered, a masterpiece, a work of art. BladeRunner is all of these things, but I feel it is also historically important, as the last, great, analogue effects Science Fiction film. All photos not individually credited sourced from SCIFIED's BLADERUNNER2 image gallery. When the crew of the space-tug Nostromo answers a distress call from a desolate planet, they discover a deadly alien life form that breeds with a human host. And so the horror begins - a horror which will end the lives of six crewmembers and alter the life of the seventh forever. Sigourney Weaver stars as Lieutenant Ellen Ripley in one of the most suspenseful and powerful science fiction films of all time. Directed by Ridley Scott, Alien's release date is May 25th, 1979. Stay up to date with the latest news on Alien by liking Scified on Facebook and by following us on Twitter and Instagram! Also, consider subscribing your email to our The Lone Gunwoman blog for instant notifications of when new posts are made! Limited Edition Jodorowsky's Dune Poster!